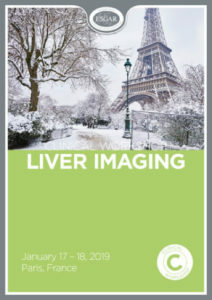 After several Liver Imaging workshops have successfully been held all over Europe, ESGAR is delighted to announce the 1st ESGAR Case-based Liver imaging Workshop, to be held at the Societè Francaise de Radiologie headquarter in Paris, on January 17 – 18, 2019. This two-day intensive practical course will focus on the most common current indications for liver imaging – cirrhotic patients, oncological patients, patients at no risk with incidental findings and response to therapy of liver tumours. The course consists of two modules per day for a total of four modules. Each module will last 3 hours and will be assigned to one speaker. There will be no formal lecture. Instead, participants will be provided with a PACS workstation (one per attendee) from which actual patient‘s liver MRI studies will be viewed. The cases will range from intermediate to advanced complexity. The participants will be encouraged to interpret the cases at their own pace. The findings will be reviewed and discussed with the teaching faculty at the end of each module.